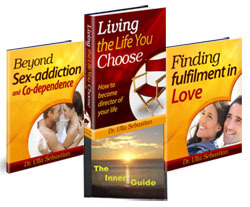 "Living the Life You Choose"
All you need is the free Adobe Reader or another PDF viewer. You can print out the books for your personal use. The book is based on fourty years of research, work with thousands of people from all over the world and a lifelong experience of Self growth and transformation. If for any reason (or no reason), you decide this information isn't right for you, just email me at any time within the next 30 days, and you will receive all your money back. Why I can offer this guarantee? Simply because I am 100% behind this offer. I know from forty years of experience that a large number of people have benefited from this knowledge and the instructions. I trust that your integrity is so great that you do not simply exploit this warranty, although you have benefited from this offer. Start with the book that appeals to you most. Learn all about it. And then choose the those exercises from the manual that you need at the moment. The detailed table of contents lets you start immediately. It's that simple. After payment you will be immediately redirected to the registration page for the download area. Click on the link: "Click here to get access to your digital products." You will also get an email from Clickbank with the subject "Receipt for Order # XXXXXX: Complete set Living the life you choose". On top you'll find the download link, as well. If you cannot see this page or have other problems with the payment, please send an email to my address contact@livingthelifeyouchoose.com. I will reply usually within 48 hours. After the payment you'll receive a confirmation by paypal. Confirmation will be under the name "Visioform Dr. Ulla Sebastian". You will be redirected to the download page. Scroll down the page, and you can immediately download the books as pdf-files and the AudioCD in mp3 format. *ClickBank is the retailer of products on this site. CLICKBANKÂ® is a registered trademark of Click Sales, Inc., a Delaware corporation located at 917 S. Lusk Street, Suite 200, Boise Idaho, 83706, USA and used by permission. ClickBank's role as retailer does not constitute an endorsement, approval or review of these products or any claim, statement or opinion used in promotion of these products. Copyright Dr. Ulla Sebastian © Living the Life You Choose 2014. All rights reserved.